Wear it. Taste it. Love it. Show your friends and family your good taste by wearing your own Mustard’s swag or taking home jars of our house-made mustards and Vienna Beef condiments. 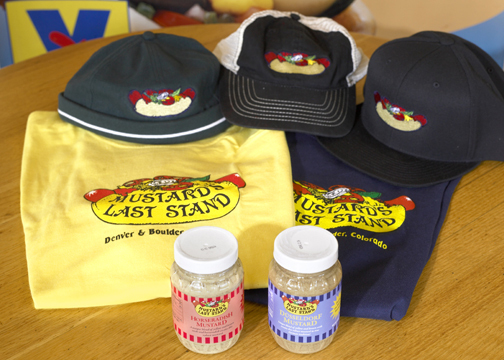 Come into either our Boulder or Denver locations and pick up your very own Mustard’s gear. Our horseradish or Dusseldorf mustards are a perfect gift for friends and family. Our gift certificates make great gifts too! Make your own Chicago dogs at home! 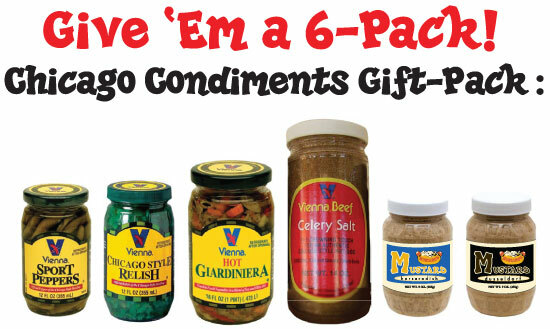 Pick up a jar or a 6-pack of your favorite condiments. House made! These exclusive mustards are robust and really enhance a dog, sausage, burger or whatever else you can imagine. We have a classic German-style as well as one for horseradish lovers. Sweet and tangy and bright green—the Chicago dog classic! It’s not a real Chicago-style hot dog if it doesn’t have celery salt, so grab yourself some! A little bit hot, a whole lot of taste. Seasoned in brine, these little peppers are crunchy and not too hot. Hard to pronounce, easy to fall in love with! This mildly hot condiment is a blend of sport peppers, carrots, celery, red bell peppers, olives and banana peppers, steeped in brine and packed in olive oil. Everything you need to make a proper Chicago dog at home! Includes one of each of the above condiments. While you’re at it, why not cover yourself with Mustard’s? 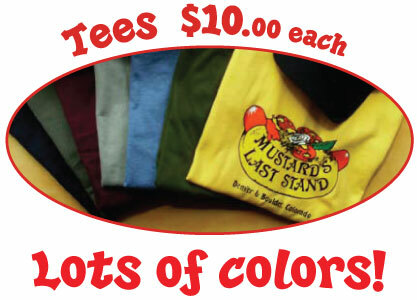 Classic cotton t-shirts in a variety of colors and sizes. Choose from a beanie, baseball cap or trucker hat. Wear your t-shirt when you order your Chicago-style hot dog and you may very well get a high five from Dan himself!